I’ve been back in BA almost a week, and I’m enjoying the buzz and seeing old friends. And, I found a place to live! A fabulous place. I move in tomorrow. More soon. In the midst of trying to decide what to do next—upload photos to Flickr, write a blog post, send an email, call my brother, get back to the spreadsheet I’m working on to track my work, etc.—my mouse clicked on over to the bookmark for this here blog, without my even thinking about it. That darn subconscious knows my readers are hungry for news, I guess! The table’s considerably messier at the moment, and my current couchsurfer’s backpack is in the corner by the window, but you get the idea. I’ll upload more pictures soon. In other “news,” I’m on Day 3 of a 13-day summer cleanse. You ease off “normal” food at the beginning and ease back on at the end, so here on Day 3 I’ve given up alcohol, caffeine, meat, seafood, eggs, dairy, bread, starches, and grains. Which leaves, basically, fruits, vegetables, seeds, and nuts! I’ll be eating some combination of those things (or less, one day is only fruit) for the next week, then slowly start to add foods back in. So far I feel pretty good, with a decent amount of energy and no serious hunger pangs. I’ve even started getting up earlier, which is quite an accomplishment (though not saying much; we’re talking 9 am instead of, oh, 10:30. I’ve been pretty low-energy here!). I’m having fun in Mendoza, though haven’t done a lot of the available activities yet. I’ve been wine-tasting (once officially, I’ve also done plenty at home! 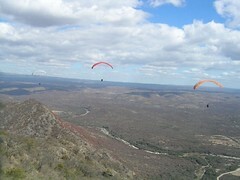 ), and went paragliding last week, which was fabulous yet again. I didn’t make it to Gualeguaychu for Carnival; it was just too complicated. But I’ve just seen some pictures and it looks incredible! If I’m here next year, I will definitely try to get there (it’s only 3 hours from BA, but at least 15 from here!). I am hoping to head out for an overnight trip to the mountains in the next few days with some other Couchsurfers, and maybe go horseback riding there. I know I’ve been absent without blogging for a while… There’s just so much going on, it’s hard to focus on one thing to write about! I promise more substantive posts soon. I took my first two tango classes ever, plus a “rock” (swing) class—so much fun! Hope to do more of that. The couchsurfing crew in BA is awesome—a few weeks ago we had a picnic in the park by my house and I think 40 people showed up. This past weekend, we had a halloween party at a bar/club, with another fabulous turnout (I think estimates are way over 100 guests, between local couchsurfers, travelers, and friends)—what a night! Last Friday I rocked out to one of the best live shows I’ve seen in a long time: The Killers. If you have a chance to see them live, you won’t regret it. For the first time in years, I was right up in the middle of the action, jumping up and down and singing along with all the Argentines (some of whom I could tell didn’t really know the words, but just mimicked the noises, like I sometimes do with songs in Spanish!). The last show I remember with so much energy was my brother’s band Marathon‘s last show in Syracuse a few years ago. I’ve also been to a few excellent dinners with a friend who’s writing an article about slow food in Buenos Aires. So many restaurants to explore here! Oh yeah, Argentina also elected a new president—the first woman elected president here, and the wife of the current president. I’m honestly not sure when she takes office—if I was reading the newspaper like I told my Spanish teacher I wanted to, I’d probably know that! Speaking of Spanish, I had a test last week after two months of taking classes (2 classes a week, 2 hours each) and I did a lot better than I expected—looks like I’m finally making some progress! Taking classes in Spanish is tricky but I’m giving it a go—yesterday was bandoneón (much more on this soon! ), and today body pump at the gym I just joined! OW. I don’t think I’ll be able to walk tomorrow. To treat ourselves after three days in a row at the gym, my friend Emily and I are headed out for a tasty dinner tonight! There’s also just a handful of new pictures on Flickr, check them out via the link on the right! Just a quick post to let y’all know I was just offered a rush copyediting job, which means a good chunk of money (the client offered twice what they usually pay me) but also an insane chunk of work, due Monday! Will be MIA until then—no blogging, email, phone calls, instant messaging… Hope all’s well! I’m positively buzzing with energy today. So many good things happening! Here’s a sampling. * My team won pub quiz last night, for the second time in a row. * I finally bought a freestanding drying rack and can now dry laundry and take a shower at the same time. * Had a meeting today with my new Spanish teacher, Gastón, who seems really cool, and I will finally be starting classes next week. * After the meeting I went to buy a new notebook for Spanish and found the air-mail stationery and envelopes I’ve been hunting all over for. * There are bright-green buds on the trees outside my window. * Tonight I’m going to a free bossa nova show. * Am going to the bus station tomorrow to buy a ticket to Tucumán province for the empanada festival next weekend. * Last weekend I met a guy who works at the hospital right by my house, and I’m meeting him there tomorrow to have someone look at my foot, which has been bothering me since something went awry while running to catch the bus a few weeks ago. Things just keep getting better! I’ve been having trouble uploading videos to my site recently so haven’t been able to share the sounds and movements of some of the things I’ve seen, like folkloric music and dance, and paragliding! I just signed up with a cool site, Vimeo, to be able to share my videos with y’all. I haven’t uploaded them all yet, but this paragliding video will get you started. There’s a link to all my videos (as they are uploaded) in this blog’s sidebar, under Nomad Chronicles. Luckily work hasn’t been very busy this week, because it was high time I got my photos back in order. After a quick chat with Mia about the virtues of various ways to post photos online, I bit the bullet and signed up with Flickr—which was actually super-easy now that Yahoo’s taking over the world and I was able to use the same log-in on Flickr. I’m loving it already. So there are a ton of new photos up (including paragliding!)—enjoy. There will always be a link to my pictures in the sidebar of this blog, and when there’s something new and noteworthy I’ll make a post like this (wherein the photo is a link).